Was Doctor/Minister the Titanic’s Bravest Man? 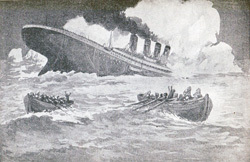 Gracie recalled no stress during the time he was under water and felt “full of vigor” when he surfaced and as he made his way to the life boat. He credited his ability to undergo the ordeal to his physical, mental, and religious training. In all, 30 men, mostly crew members, ended up on the bottom-up boat. When it was fully occupied, those on board had to push away others who were trying to mount it. It was during this time that Gracie heard what he called a “transcendent piece of heroism that will remain fixed in my memory as the most sublime and coolest exhibition of courage and cheerful resignation to fate and fearlessness of death.” This was when one swimmer was refused assistance and turned away by others on the raft. In a “deep manly voice of a powerful man,” which Gracie did not recognize, Gracie heard the swimmer reply: “All right, boys; good luck and God bless you.” The man then swam away. As Bateman reportedly said “God bless you!” to his sister-in-law before leaving her, and the rejected swimmer said “God bless you!” before swimming away, Bateman emerges as the best candidate for the heroic swimmer mentioned by Gracie. Moreover, Bateman was a second-class passenger and Gracie a first-class passenger, which could explain why Gracie did not recognize the man’s voice. All the horrors of that hour? To sustain me by His power. Bateman’s body was recovered three weeks later by a cable-laying vessel. Next post: March 5. More about William T. Stead in an April post. Although Imich, who turns 109 this Saturday, February 4, is pretty much confined to his Manhattan apartment and somewhat limited in his research activities these days, he has spent a good part of the last 85 years, studying the evidence for the reality of a non-mechanistic universe and life after death. “My goal in life has always been illumination,” Imich told me when I interviewed him in 2003 on the occasion of his 100th birthday. Although I haven’t had a chance to speak with Imich in a few years, I have exchanged a few e-mail with him and he still seems to be pursuing illumination, while also anxious to explore other dimensions of reality first hand. “I am very interested in finding out how things are on the ‘other side,’” he wrote to me in an e-mail before his 108th birthday. He was even more impressed with the phenomena he observed in recent years with physical mediums Joseph Nuzum and Dr. Safwat El Amin. He saw Nuzum levitate and move through the air in his (Imich’s) hotel room, and has observed many apports with El Amin, including one in which thousands of dollars in cash appeared in a big box near Imich’s laser printer but then disappeared within a few seconds. He also witnessed spirit photography in which his deceased wife appeared next to him in a photograph. 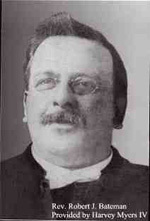 Imich’s interest in psychical research and parapsychology began during the 1920s. As a scientist, he approached his investigations with proper skepticism, but came away from his many sittings with Matylda convinced that there was no fraud or chicanery involved. “The shock was too strong,” Imich wrote of his first two sittings with Matylda. “It was now necessary to bring new order to my world view, to find a place for the discovery of this extraordinary reality. So many conceptions of my early years would have to be changed!” Imich began to wonder why his fellow scientists were interested in investigating things that paled in comparison with the question of life after death. He decided then to devote his life to parapsychology. Born in Czestochowa, Poland, the third son of a corporate bank president and founder of a Jewish hospital, young “Alech” was educated at home until the age of 10 by a governess and several tutors. Although his town was under German occupation during WWI, Imich was able to continue his education. However, when the Russian attacked Poland in 1918, Imich, then 15, joined the army and became a truck driver. After the Bolsheviks were repelled, he returned to school, studying chemistry, mineralogy, botany, biology, astronomy, advanced optics, and mathematical logic. His Ph.D. thesis at the University of Krakow was on the digestive systems of microscopic worms. Imich came to the United States with his wife shortly after World War II, initially living in Bucks County, Pennsylvania. After Vela transitioned in 1986, he moved to New York City and continued his research into psychic phenomena. Although he has found personal fulfillment in parapsychology, Imich is frustrated at the reluctance of mainstream science to accept the evidence for psychic phenomena and the afterlife. As he sees it, the religious superstitions of the medieval age continue to influence the scientific community while there is little funding for research. Imich recognizes that the existence of ESP and other psychic phenomena, such as levitations, does not necessarily lead to a belief in an afterlife, but it clearly defies the mechanistic theory. He says that “communications from and appearances of deceased people” have been the major phenomena leading to his belief that consciousness survives death. Michael Tymn’s book The Afterlife Revealed: What Happens After we Die is published by White Crow Books and available from Amazon and all good online book stores. Michael’s forthcoming book Transcending the Titanic: Beyond Death’s Door is published in March 2012 by White Crow.